Boston Community Transport volunteer driver Jess Maidens. A ‘vital’ community car scheme which helps elderly and vulnerable people is in desperate need for volunteers to keep it going. Boston Community Transport (BCT) provides low cost door-to-door transport to those who cannot use other forms of transport due to their age, frailty, disability or need for assistance. The charity’s volunteer drivers have dropped from 12 to sixin recent times and there are now real fears for its future if more people don’t get behind it. Gill Williamson, BCT business development officer, said: “We provides a unique service in the area, and without it, there will be people who are unable to get to vital appointments. Our volunteer drivers do what a friend or family member might in other circumstances. Earlier this year the county council asked Lincolnshire Community and Voluntary Service (LCVS) to step in to help Boston Community Transport to secure its future. LCVS is attempting to recruit volunteers to keep the service going, and looking for ways to secure its long-term future. In addition to drivers, a volunteer bookings clerk and additional trustees are required. Volunteer drivers use their own vehicles and they do not need to commit to a minimum amount of hours. They can chose to only cover local journeys or those further afield including to out-of-county hospital appointments. Drivers must be prepared to wait for clients while they attend appointments. All drivers undergo a criminal background check – at no cost to them. Volunteer drivers are particularly needed in the areas of Stickney, Old Leake and Wrangle. To use the Boston Community Transport service there is an annual membership of £12 per household. Journeys cost 55p per mile, with a minimum charge of £4. Volunteer drivers have mileage expenses reimbursed at 45p per mile. One-off use of the service may be possible, without the need for membership, by prior arrangement. Boston Community Transport bookings line is usually manned 9am-12pm Tuesday, Wednesday and Thursday and there is an answerphone at all other times. To ensure bookings are dealt with as efficiently as possible, clients are asked to leave their name, address, details of where they want to go and when. Boston Community Transport responds to all journey requests within three working days. Contact the team on 01205 315934 or email bostoncommunity.transport@ymail.com. Jeff Maidens has been volunteering to support his community all his life and joined Boston Community Transport as a driver around three years ago. Jeff began volunteering as a 13-year-old when he joined St John Ambulance before serving the volunteer ambulance service. In 1971 he became a volunteer police officer and went on to serve with Lincolnshire Special Constabulary in Boston and Kirton for 28-and-a-half years. In addition Jeff was a retained (part time) firefighter for six years. During his time with the special constabulary Jeff was one of those who voted for the service to remain unpaid – believing it helped ensure those who took up the role were there wholly for public good. Lincolnshire Community and Voluntary Service (LCVS) runs Boston Volunteer Centre at the Len Medlock Voluntary Centre, in St George’s Road, Boston. 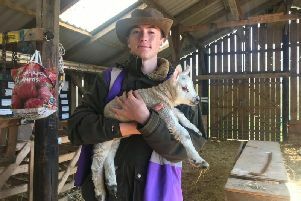 LCVS volunteering officers work to match individuals to their ideal roles with opportunities in a wide array of areas including everything from administration to working with animals, DIY to providing social media support.